Who doesn’t love being a weekend warrior? Especially when it comes to all those great home projects that you line up for yourself. Every time you walk around in your favorite home improvement store, those videos you pass make many DIY enterprises enticing. If you are going to be undertaking any home adventure that involves plumbing, we can help you avoid the most common plumbing mistakes. Too many homeowners think they can tackle any maintenance, plumbing, or faucet problems without really knowing a lot about plumbing. 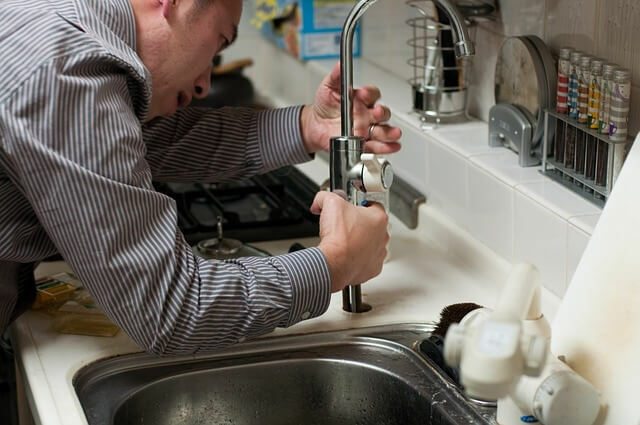 Yes, you may have looked online at some videos and now think you’re ready for the plumbers’ exam, but when you run into trouble like these common plumbing mistakes, chances are you won’t have the faintest idea how to fix it. When you undertake a plumbing project, make sure you have the skills to complete it correctly. This means having all of the tools necessary. Before you start. Every DIY plumber should have basic tools such as a hand auger, a basin wrench, and a plumber’s wrench at the ready. If you don’t know what these tools do, you shouldn’t be taking on a plumbing project, even if you’ve viewed the videos and think you know what you’re doing. When undertaking a plumbing project, the first thing you will want to do is to turn off the water at the source. It’s a bit like turning off your electricity when fixing broken wires. Most plumbing projects require that you turn off the water, but this is an easy step to forget. Especially if you will be attempting to remove a fixture or fix a pipe, the last thing you want is a large spray of water shooting out at you and damaging your home. If the shut-off valve hasn’t been used in a long time, it can be tough to negotiate. Again, special tools are needed for the job. You might want to use a plumber’s wrench. If you have trouble locating the shut-off valve, shut off water from the outside. Don’t create messes before you even get started. One of the most common plumbing mistakes here. Believe it or not, regular use of drain cleaners can damage pipes. It’s inevitable that sooner or later drains will be slow to empty and bathtubs will occasionally back up. Drain cleaners are an easy fix, but don’t overdo them. It’s okay to use a drain cleaner to help you out with the slow drain issue once-in-awhile. When you have a clog that is hard to get rid of or consistently comes back, however, try something different. A rented drain snake. Most home improvement stores and industrial plumbing supply stores such as ours carry drain snakes. Natural drain cleaner. You can make your own drain cleaner with items you have around the house. Materials like vinegar, baking soda, and water can be combined to make a natural drain cleaner, which is easier on the pipes and safer for you. There are numerous places online to find the right combinations for your stuffed-up drains. Hand auger. This type of tool is a long stiff cable with a twisted end that gets right into the clog in the drain. It can loosen and extract any unwanted material that is sticking there. We have commercial plumbing parts readily available. Homeowners will often fix problems on their own. If you have more than basic plumbing expertise, you may have handled a minor leak or fix that you think is appropriate. Unfortunately, when it comes time to sell your home, these types of fixes can often come back to bite you. If you are not aware that certain plumbing repairs require building codes or permits, you’ll find out quick enough when your homeowners insurance doesn’t renew or a home inspection points out your mistake. Un-permitted work done by you can cause major trouble for you down the road. That’s why it’s so important to know that what you’re undertaking is allowable. Some repairs can hold for a while, but when they fail they can cost far more in repairs than bargained for. It can be cheaper to get something repaired professionally the first time around. Not every plumbing problem is a DIY project. If you truly don’t have the knowledge necessary to fix it, it’s time to call up your local industrial plumbing supply manufacturer. Whether it’s for HVAC parts and supplies, AC or heating supplies or plumbing parts, you want to know you are getting the best advice and the right tools and parts for the job. Don’t find out the hard way that your plumbing fix is a bust. Know these common plumbing mistakes and decide what you can and can’t do and leave the latter to the experts.